Some may call this unnamed collector crazy for spending a cool one hundred million times the face value of a 1913 nickel. Others envy the ability to drop $5 million on a single purchase that you can’t live in. Whatever your opinion may be, for numismatists, the 1913 Liberty Nickel is one of the most highly sought after and prized coins in United States history. You have to wonder what the collector is going to do with it. One would assume they’ll want to admire it in their own hands, but they’ll have to be awfully careful with it. Imagine the frustration of accidentally flushing it down the toilet or having it slip through a hole in their pocket. It’s not the kind of thing you can replace you know. Concerns for its well being aside, here’s the press release. (Santa Barbara, California) – An unnamed California collector has paid $5 million for the Eliasberg specimen 1913 Liberty Head nickel, a record price for the coin and the second highest price ever paid for any rare coin. “The new owner is a long-time Southern California resident and a dedicated collector of historic United States rare coins,” said Santa Barbara coin and jewelry merchant, Ronald J. Gillio, who negotiated the sale between the collector and the sellers, Legend Numismatics of Lincroft, New Jersey and Washington state business executive, Bruce Morelan. Legend and Morelan jointly purchased the coin from New Hampshire dealer, Ed Lee, in May 2005 for a then-record price of $4,150,000. It is graded Proof-66 by Professional Coin Grading Service, and is the finest of the five known 1913 Liberty Head nickels. Gillio said he talked with the collector about the coin for over three months. 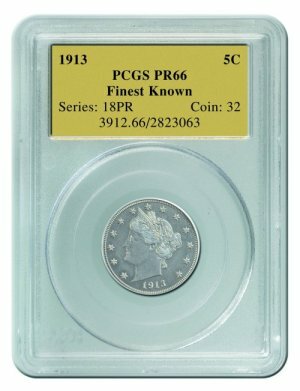 “We spoke many times in recent months about the coinâ€™s legendary numismatic status, and he agreed to purchase it for $5 million,” explained Gillio who recently was named Numismatic Acquisition Coordinator for Spectrum Numismatics International and Bowers and Merena Auctions, and continues his role for Collectors Universe as General Chairman of the Long Beach and Santa Clara Coin, Stamp & Collectibles Expos. The unnamed collector took possession of the coin at an undisclosed Southern California location on Wednesday, April 25. Only five 1913 Liberty Head nickels are known today. Two are in permanent museum collections at The Smithsonian in Washington, DC and the American Numismatic Association Money Museum in Colorado Springs, Colorado. One of the previous owners of this particular 1913 Liberty Head nickel was renowned Baltimore banker, Louis E. Eliasberg Sr., known to collectors for the extensive, one-of-everything collection he assembled before his death in 1976. “We’re pleased that this coin now is in the collection of another devoted numismatist. We hope he enjoys it as much as we did,” said Laura Sperber, a partner in Legend Numismatics. The world’s record price for any rare coin is $7.59 million paid for a 1933 U.S. $20 denomination Double Eagle gold coin in July 2002. « Coin Collecting a Good Investment?